So driving up to Indy just for the men's and women's 10,000m races at the USATF Championships was SO worth it. Here is a very good account of both races. The men's race was exciting to watch, but the women's race left me breathless. 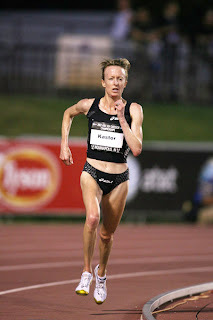 I have a lot of admiration for Deena Kastor, and when I heard she was running the 10,000m at nationals, that became one of the main reasons for wanting to go. I wasn't sure what would happen, since she hasn't raced on the track in a long time and has been concentrating on longer distances lately. She also had skin cancer not too long ago. When the race started, I was trying to pick her out of the crowd. I found her on the second lap (we were seated in the front row at the top of the frontstretch). Mark asked me which one she was, and I told him I would point her out on the next lap. By the time she came around again, she had opened up a good 15-20 meters on the field, so that was pretty easy. 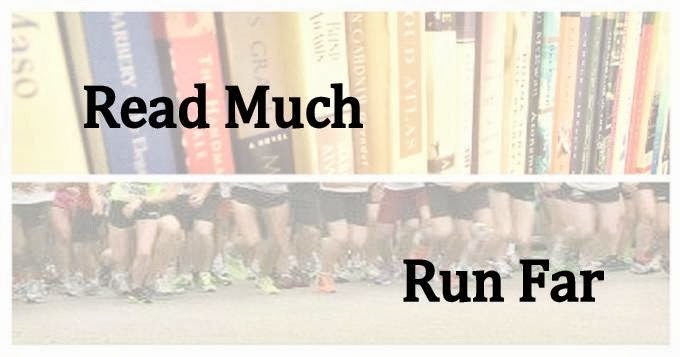 She widened that lead; eventually she lapped almost everyone except for the chase pack which consisted of five or six people, and she was at least 200 meters ahead of them by the end. I have never seen such a show of utter dominance in a distance race, and to see it as this level was astounding. Now, Kara Goucher and Katie McGregor have both run better times than what Deena ran yesterday, but they didn't have it in them this time (it had cooled off from the day's heat, but was still warm and humid). Deena needed a 32:00 to qualify for the World Championships, and she ran a 31:57 with almost perfectly even splits, like clockwork, all alone. She didn't PR, but she did set a new Indiana soil record. And then? She took a victory lap, and started slapping hands with those who held them out. So I leaned out, yelled "Nice job tonight!" and she slapped my hand and said "Thank you!" That's right! Deena. Kastor. Touched. Me. Maybe some awesomeness will rub off on me? :) Some people got pictures with her or her autograph, but I was too starstruck and intent on getting the high-five. Later I approached with the hope of getting an autograph, but she had to take off before I got a chance. Eh well. Awesome experience nonetheless. Mir thats great!!! see people run at the speed of light!! and you got to touch Deana Kastor!! Girl I hope some of that mojo rubs off!!! 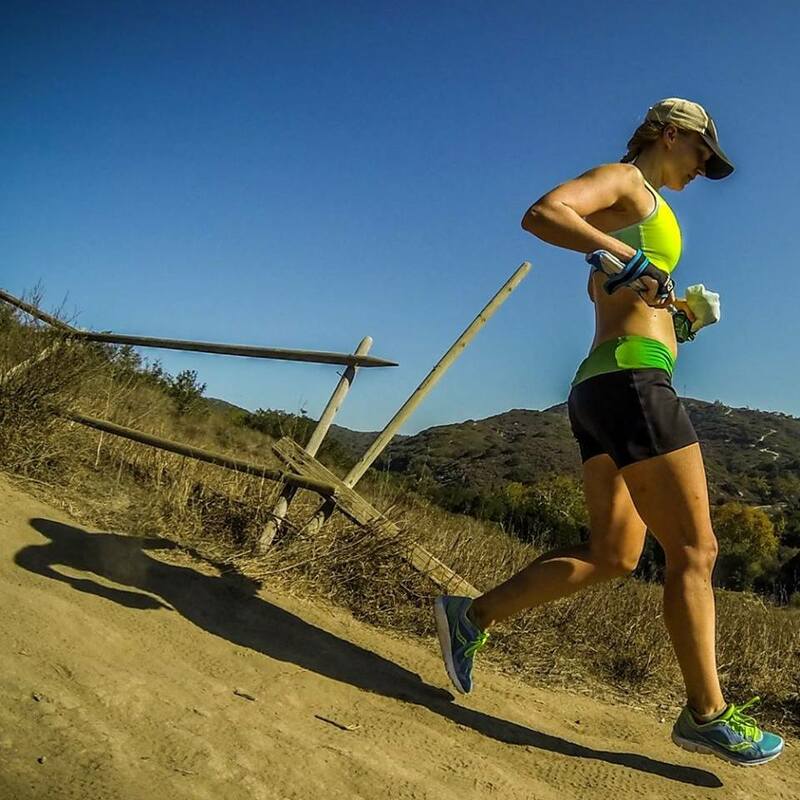 I am very jealous that you were able to see Deena Kastor run, and have her slap your hand. 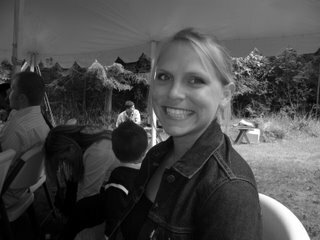 I wonder if she will marry me...lol She is an awesome runners and role model. Gah!!! That's so awesome. I love her! How cool you (however briefly) met her, you lucky! I'm so jealous! I love Deena! Although I was lucky enough to meet her and shake her hand in San Diego in '03, prior to my first marathon. Her good vibes rubbed off on me and I ran a sub 4 for my first marathon. She is one of my all time favorite, favorite runners! Lucky you to have been high fived by her. She's awesome!! !